*You can go to the Network Access page and click Log into SafeConnect to force the network login prompt. You may need to click Log Out of SafeConnect first. This will not work if you are directly connected with an Ethernet cable. On the network login prompt, select Click here to join the secured UND network or navigate to http://wireless.und.edu in your web browser. On the welcome screen, select your operating system from the drop-down selections and click the Join Now button. You will be prompted to Run or Save the application. When finished downloading, you may need to double click the application in your Downloads folder. When prompted, enter your NDUS username and password, then click Next. You will see the progress bar move from CONFIGURE, to AUTHENTICATE, to JOINED. Click Done once you have joined the UND secure wireless network. What is SafeConnect Network Access Control? Check out this knowledge base article I found in the University of North Dakota knowledge base. https://und.teamdynamix.com/TDClient/KB/ArticleDet?ID=63058 How do I connect to the UND secure wireless network? 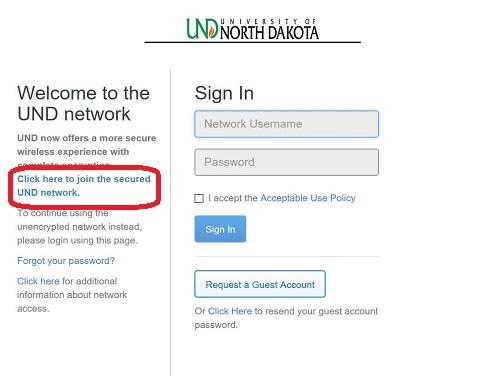 Step-by-step instructions show how to join the UND secure wireless network.